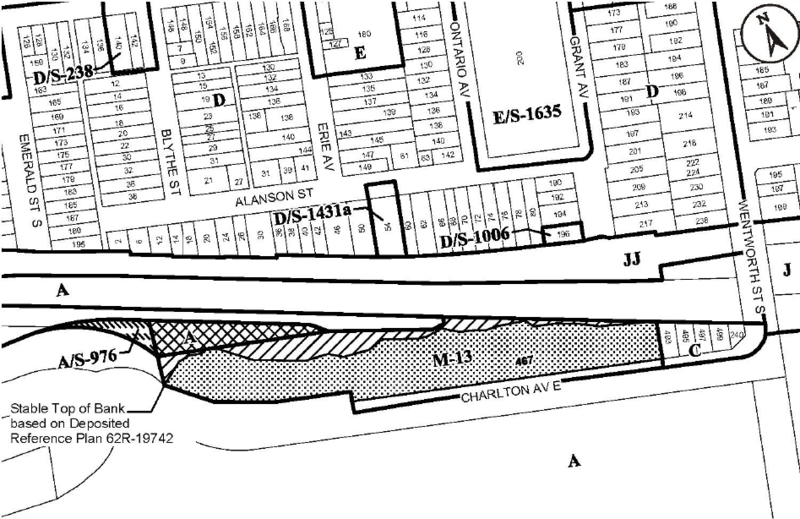 A zoning by-law amendment for 467 Charlton Avenue East is on the agenda for tomorrow's Planning Committee meeting (see item 6.8 for the associated documents). Planning staff recommend approving the application to build three multi-storey buildings on the site, a plan that has some local residents crying foul. Note: there are newer renderings of the plan that more accurately reflect the size, shape and placement of buildings and trees on the site. The plan is to build two six-storey buildings and one five-storey building with a total of 162 condominium apartment units with 1.2 parking spaces per unit on the long, narrow property. 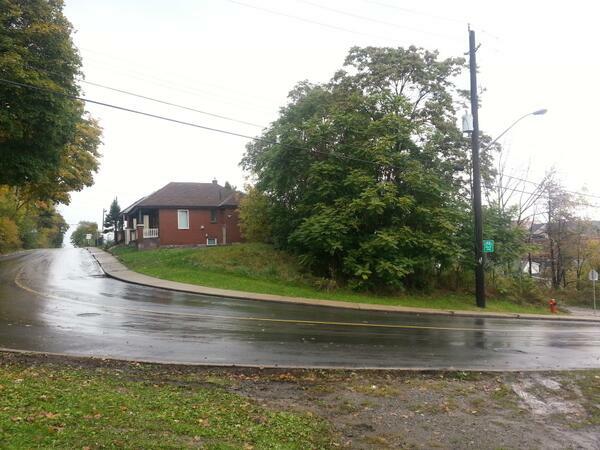 The property sits on the north side of Charlton Avenue East on a terrace of the Niagara Escarpment. The site is in the southern edge of Stinson Neighbourhood, just west of where Charlton bends into Wentworth Street and just south of the Escarpment Trail. 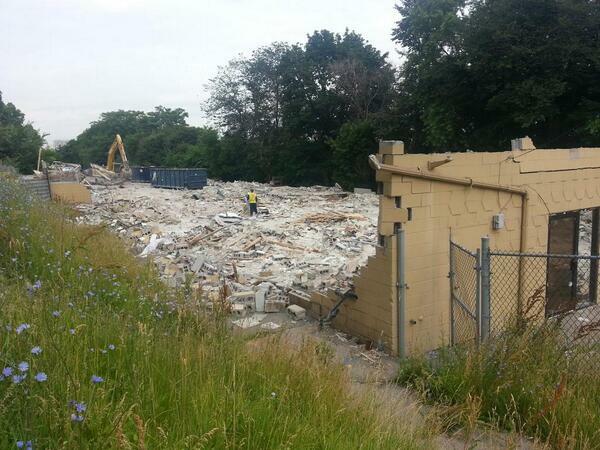 Originally a bowling alley, the old one-storey building on the site served as a Hamilton Cab, limo and Ontario Patient Transfer ambulance depot before it was demolished earlier this summer. The development plan requires the main part of the property to be rezoned from Prestige Industrial to High Density Multiple Dwellings, while the back of the property (adjacent to the Escarpment Trail) must be rezoned from Zone A - Conservation, Open Space, Park and Recreation to Zone P5 - Conservation / Hazard Land. Staff recommend approving the plan because it supports the Provincial Policy Statment by revitalizing a brownfield site, increasing density in an existing built area and providing a more diverse mix of residential housing types. It also supports the Growth Plan for the Greater Golden Horseshoe, which emphasizes building compact, complete neighbourhoods and maximizing the use of existing municipal infrastructure. Some local residents have organized a group called "Residents Advocating Responsible Escarpment Development" in opposition to the plan, citing concerns about: how the development will affect the Escarpment Trail; its impact on the visibility of the "green wall" of the Niagara Escarpment from other vantage points around the neighbourhood; and excessive noise and traffic. Staff also recommend reducing the height of "Building C", the most visible of the three buildings, to five storeys to reduce its visual impact. The area of the highest visual impact is generally directly north of Buildings "B" and "C" along Grant Avenue, Ontario Street and Erie Street, and between Alanson Street and Stinson Street. 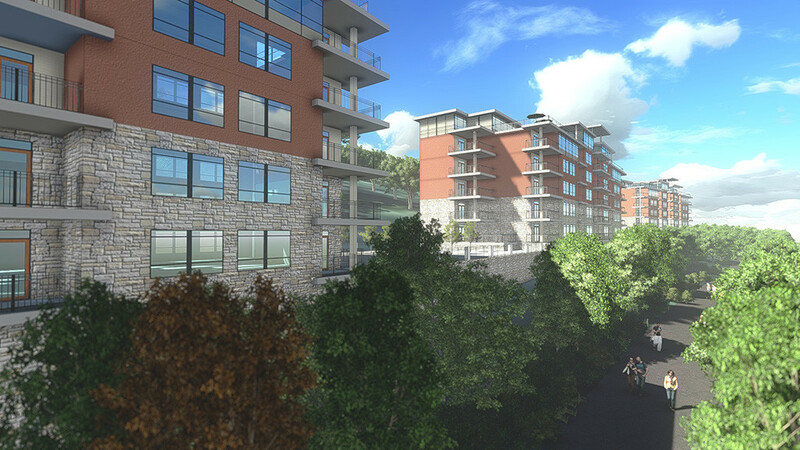 The proximity of this area to the Escarpment and the site, the viewing angles, the open nature of large properties such as the Stinson Street Lofts, and the absence of mature trees, contributes to a more pronounced view of the Escarpment. Within this area it was noted that the viewsheds to the Escarpment would be limited to portions of the proposed buildings (i.e. the ends of the buildings and the upper three floors) due to the vegetated nature of the slope, however, Building "C" would have a strong visual presence from certain viewing areas such as Alanson Street and Grant Avenue, which provide a wide panoramic viewing area. As noted, to reduce the impacts of Building "C", it is recommended that the building height be limited to five storeys. The use of appropriate colours and materials, particularly during periods when there is no foliage, would also be recommended for all of the buildings, to enable better integration with the natural colours of the Escarpment. 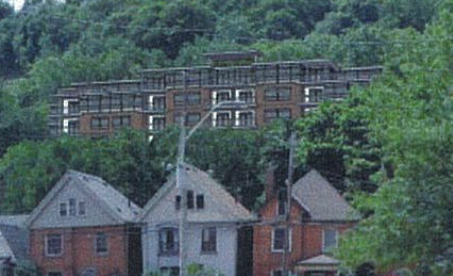 The Niagara Escarpment Commission (NEC) issued a review of the Visual Impact Assessment that disagrees with the plan as proposed, arguing that the building heights should be reduced further - four storeys for buildings B and C and a terraced design for building A - to reduce the visual impact of the buildings. In terms of its impact on the Escarpment natural environment, staff stress that this is already a developed site and the development is designed to maintain existing nearby vegetation and to minimize the risk of bird strikes against the building. The building is set back from the property line on all four sides and will not impact the lower slope on the north side - it will be built entirely on stable land. The most significant disturbance in the plan is a possible walking/cycling connection from the property to connect to the Escarpment Trail on the northwest side. The Hamilton Conservation Authority (HCA) reviewed the engineering report and grading plan and concluded that the development will make the site less impervious for the purpose of absorbing rainfall and storm water runoff. The HCA also requested more detail on the plan to reduce bird strike risk and will review the plan again at the site plan approval stage. Increased traffic is another concern raised by opponents. Traffic is already a problem where Charlton bends into Wentworth and crosses the Escarpment Trail. Last year, a runner was killed by an impaired driver at the corner, and the Ward 2 Participatory Budget process recently approved a capital investment for a safer pedestrian crossing at the trail. According to the Corktown Traffic Management Plan, Charlton carries 8,000 - 14,000 cars a day on one lane in each direction. That plan recommends traffic calming measures to reduce automobile volumes and speeds on Charlton. The 467 Charlton development plan, in contrast, calls for Charlton to be widened with a dedicated left turn lane for eastbound traffic to serve the site. Opponents also cite a noise study by Aerocoustics noting that due to the combination of automobile and rail traffic, noise levels in outdoor areas on the development itself will be higher than the Ministry of Environment regulations. However, the staff report notes that acoustic barriers are no longer required in the revised development plan, as the outdoor terrace areas between the buildings have been reduced in size below the minimum size that falls under MOE regulations. In addition, people buying units in the buildings will have to sign warning clauses to state that road and rail noise may occasionally exceed recommended levels and that rail noise may occasionally interfere with outdoor activities on the site. The report concludes that the development will not introduce additional noise impacts to other properties in Stinson. However, local opponents argue that the development will bring additional automobile traffic, which will increase noise more generally in the neighbourhood. 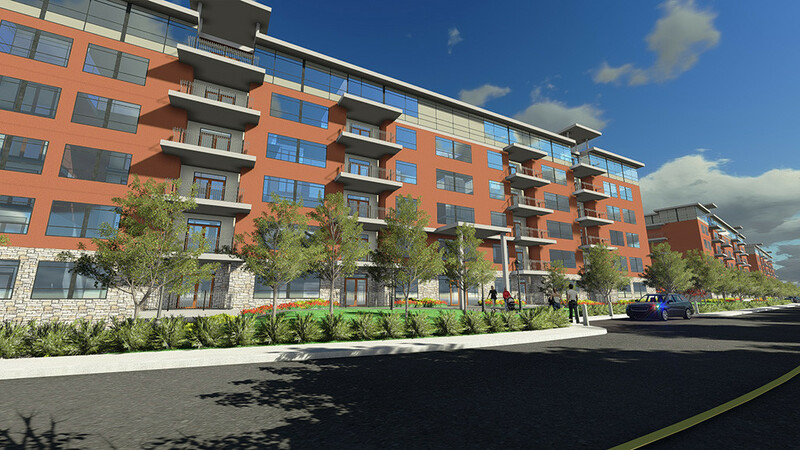 The density is fairly modest, the height is by no means excessive, the project has been designed to minimize disturbance of the Escarpment Trail green belt, and the buildings themselves have been styled and coloured to minimize their visual impact. This seems like a good project - exactly the kind of thing we should be encouraging. The fact that its close proximity to the Escarpment Trail is being viewed as a positive value proposition is encouraging. It should attract buyers who appreciate active mobility. My main complaint about this project is that I wish it had a more urban design, something with more of a streetwall rather than three separate buildings set back from the street, each other and their neighbours and surrounded by parking. And as an example of how regulations can backfire in perverse ways, the developer has gotten around the issue of excessive outdoor noise by shrinking the outdoor socializing areas so they don't fall under MoE regulations. That does nothing to reduce people's exposure to excessive noise, it just gives them less usable space in which to do it. It would be easy to chalk the opposition up to reflexive NIMBY opposition, except that it's easy to understand why people become skeptical about the claims of developers and the oversight of city planners. This city hasn't had a lot of great examples of infill developments over the past couple of decades to instill a high level of confidence that this won't just be another bait-and-switch. In that regard it is encouraging that the plan has been modified from its original proposal to address the legitimate concerns that have been raised. The purpose of community engagement should be to make developments better, not to prevent them from going ahead. But realistically, it will probably take a few years of good projects followed through to successful completion before residents start to regain confidence in our collective ability to design and construct good buildings that improve their surroundings. Update: added a link to a more recent article with newer renderings. You can jump to the added paragraph. It's too big for that plot of land. It may be only six stories, but it's half way up the escarpment making it look a lot higher. It's also 377 meters wide, the length of James to Bay. Just browsing through the washed out photographs of appendix H and the clear colour photos in appendix I tells me someone's not being forthright about the visual impact on the neighbourhood. The nicest part of the neighbourhood at that. I'm somewhat surprised you would champion a city block wide monolith that will dwarf a quaint Victorian neighbourhood, but to each their own. Poor Stinson though, always getting screwed over one way or another. I'm sorry, Ryan, but I think you've misjudged this one. Screencarp--and the NEC--have it right. No doubt some of the opposition--and some of the reasons--are reflexive NIMBYism, but no one could say that about NEC's assessment. The proposed development is too big for the site and inappropriate to the neighborhood and the landscape. Let them scale it back per the NEC recommendations, and I would be happy to see it go forward. It may not be excessively high in absolute terms, but the ground at this site is already three storeys or more above most of the neighborhood, so you're getting the effect of a nine- or ten-storey building right against the escarpment. Good for the developer, and good for the people who get to live in those units--but bad for the rest of the neighborhood. Well, I've got my popcorn, my beverage-of-choice, and a nice comfy chair. I'm all set to take in how this discussion unfolds. It's funny, though: the 'opposition' to this project reminds me of opposition to development on the south side of York Boulevard. Where the adjective 'inappropriate' ruled the day. 'Increased density' projects are championed...as long as they're somewhere else. And when a 'sensible' development is proposed elsewhere, the people who work hard to keep such projects out of their own backyards are usually the ones to champion that development by-and-large, citing need and common sense. Such a shame that all of this turns into an 'Us vs Them' situation. A few of us remember the York opposition a bit differently. Strathcona folks opposed demolishing rows of century homes for parking lots for new buildings on the south side of York but had no problem with the new buildings themselves. But nice try fomenting the 'Us vs. Them' situation you say is such a shame. The purpose of community engagement should be to make developments better, not to prevent them from going ahead. What if the community is opposed to development? Is that allowed, or is all development an unquestioned "good", with design refinements being the only function of community engagement. Personally, I don't see a problem with the height being proposed ... that would be a nice mid-rise addition to the area. The proposal itself is nothing special design-wise, though. Pretty standard modern slab block condo apartments from the look of it. And Screencarp has a point about them looking like a long monolith. The other concerns, re: traffic, noise, environmental impacts, and so forth, are probably overblown. What if the community is opposed to development? A city is necessarily a big mess of overlapping property rights and externalities. It is often a challenge to balance a property owner's right to do something with their own land against the rights of their neighbours not to have their quality of life/property values negatively impacted. It seems unreasonable to let a property owner do whatever they want, and it also seems unreasonable to grant neighbours a veto over any new development nearby. With good rules (I prefer form- and performance-based codes to strict use zoning), evidence-based planning oversight and proactive public engagement, it becomes possible to achieve a mutually beneficial plan that meets the developer's wishes without hurting the interests of neighbours. That process works best when there is trust: trust that the developer is socially responsible, trust that the planners are competent and fair, and trust that neighbours are willing to meet a good plan halfway. . I understand the dilemma of competing/conflicting property rights. Still, if it's all about "good rules" and "evidence-based planning oversight" what's left for "proactive public engagement" to contribute? I mean, wouldn't that be made redundant by the rules and evidence? For the same reason that justice needs to be seen to be done: we get better rules and fairer, more sensible planning oversight when citizens are engaged in developing and applying them. No doubt. I shouldn't be so subtle. We need public participation. My point was that it isn't strategically wise to put limits on what can be legitimately expressed via it. You are proposing an consensus-driven process and seem to view planning and design as involving technical questions in the main. Planning and development is a political process that involves competing interests and visions for the city. I may think the development is reasonable and a good-fit. I also disagree with the knee-jerk opposition to development that is expressed by some of my neighbours in the North End. I still don't agree that community engagement should be limited to "improving" proposals the way you expressed it. That may seem prudent at this conjuncture following a period of limited intensification across the city. Do you think residents would be similarly opposed to stacked townhouses? It feels a bit like you're trying to put words in my mouth. I'm not saying the only thing community engagement should do is "improve" a proposal. If a proposal is bad/inappropriate design and planning, community engagement should be able to put a stop to it or demand major changes, and in some cases the proposal itself can come from neighouring residents. But that should always be based on sound and accepted principles tested against the local context, not just reflexive opposition to change or shameless capitulation to narrow commercial interests. In addition, I believe the planning framework in which proposals are evaluated should also developed with community engagement. I've seen many situations in this city in which the residents have been ahead of the planners in terms of their progressive vision for their community. The bottom line is that it's a messy business. The best chance for good decisions to get made is for the city to develop and implement reasonable, inclusive planning frameworks that include meaningful community engagement and seek to balance and integrate the competing interests and visions you correctly note. Neither developers nor planners nor residents always know what is best, and an open dialogue in which ideas are challenged and defended gives us the best chance at making good decisions. Not trying to put words in words in your mouth. You said "The purpose of community engagement should be to make developments better, not to prevent them from going ahead". You may intend us to read between the lines, but there isn't much nuance expressed in your assertion. I'm sensitive to slippages in arguments. Your reply above expresses a very much more nuanced take on the matter ... I agree with you. Ideally, planning and development should be a reflexive/iterative process that attempts to accommodate community concerns and desires. Where the engagement process is substantive and meaningful the end result in theory should be better than if no consultation took place. Of course, I'm not opposed in principle to intensification and don't think that neighbourhood "character" is or should be viewed as static (or be too strongly anchored in the physical fabric of a place). It's hard to know in advance how detailed and nuanced a piece needs to be. I usually tend to err on the side of putting too much in; perhaps I erred this time by not putting enough in, but the article already felt overlong and I didn't want to boil the ocean. In any case, sorry for my sloppy wording. Yeah, I'm well acquainted with that problem ... sometimes you can't win. I dunno. That rendering really doesn't look "towering" to me - there's still plenty of "green wall" above the buildings. It's certainly no worse than the Claremont and other accesses cut up the escarpment (that's a pretty low bar though). 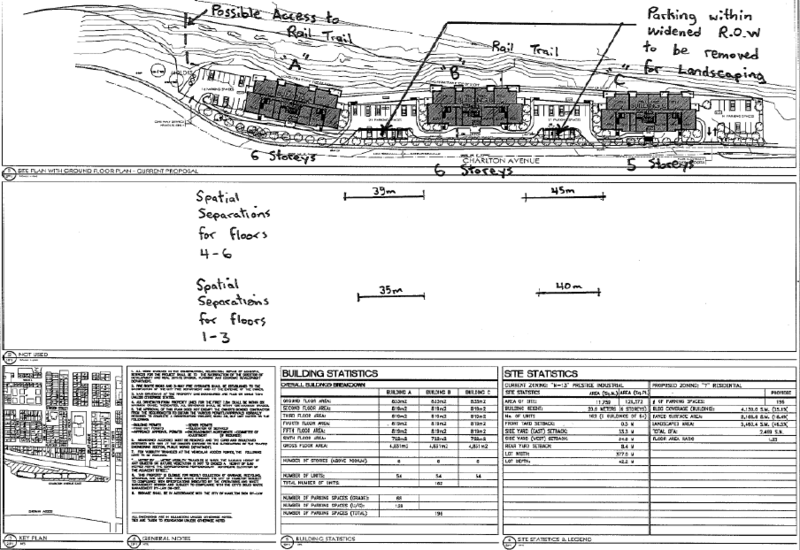 I'd like to see a rendering of the whole site plan though, as seen from, say, Stinson. As for traffic, maybe this is an opportunity for the city to horse trade - institute some traffic calming measures we couldn't afford last round (pedestrian activated crosswalk at rail trail), new rail trail connections, etc. If the developers want to profit, they can pay to appease some of the concerns. Is it possible to write a letter to the Planning Committee and email it in? Since I do not live within 120 metres of the site, I was unaware of this proposal until reading of it here. I see that the meeting starts at 9:30 AM when, of course, I have to be at work. I mentioned this previously and the author states it above- I really think the issue is our 4-decade long drought of any urban development. People are rightly nervous about what they will get from a city hall that only understands box stores, cul de sacs and highways. I hope after a few good projects are complete people will realize that new development in their hood is a good thing. Someone alluded to the York Blvd example above. That was 100% about the demolitions of blocks and blocks of heritage homes NOT to make way for new condos but to make way for the massive parking lots the city would mandate behind the new condos. We suggested over and over (I was involved in this with the SCC) that the city not have rear parking lots so they could still see narrow new buildings built on those York plots. But they don't understand development unless half the neighbourhood is paved over. As it turned out, York was still zoned high density and we are fine with that. The century homes remained low density. Strangely enough there was a property owner at Stonewalls and associated warehouses on York who wanted the high density mixed use zone for that corner but the city wouldn't give it to him. He has medium density, despite a massive lot already assembled that could house high density housing. A 29-storey condo proposal will be announced there next month. I personally don't mind the height but will wait to see the actual site plan. Still, strange how the city tried to force high density and demolitions on an area where it made little sense yet wouldn't apply it down the street at Queen where it makes perfect sense. This Charlton project looks fantastic. This would be ideal for York Blvd south side. I love that it ties into the rail trail. Google Maps shows a 15 minute walk to the Augusta strip. I suspect this will be approved and will add much needed new residents to this area. Also, gotta add. I'm not a fan of widening Charlton for a left turn lane. Imagine Toronto added left turn lanes into every single new downtown condo? Hamilton needs to get over itself. It's not the end of the world if people need to slow down or stop while someone turns left. It would help this whole area to have slower traffic. I take your point. Adding left turn lanes isn't always needed. But when I lived in East Toronto, Dundas East was a similar kind of street ... one-lane each way and it had left-turn lanes at major streets. It was an excellent street for getting around ... I used it to get to places further east via car or cycling (it also had well-used bike lanes). So glad that my minions continue to do my work! Why improve the city in my back yard? Let it happen elsewhere I say. Carry on gang. Voice your opposition. It makes me smile. This City has always been about the developer not about the people. It's the same old scam I see carried out all the time, ask for 8 stories when all they really wanted in the beginning was 6, to make it look like the developer is on the peoples side and reduce it to that 6 which is all they wanted in the first place. Lobbying is alive and well in this city. I personally still don't understand this height phobia in Hamilton. Does it really make a difference in the end of a building is 8 or 6 floors? Ditto for the Tivoli where the city is trying to cap development at 12 instead of 22 floors. Really? Will it look or feel any differently walking down the street at either height? Local opponents to every project seem to point to Vancouver as an example of what we should be doing instead. Yet I guarantee you if a developers proposed a 3-storey townhouse podium with a slender 25 storey tower on top those same folks would freak out. I personally prefer shorter mixed-use buildings like Charlton Ave close to single family homes, and taller buildings in areas where no low density homes will be impacted, such as the Tiv or James Baptist. Having said all that, to me the biggest issues we face continue to be lack of mixed-uses and lousy architecture. Hamilton really needs more mixed use developments and more modern building materials, not stucco panels and blank brick walls. The Design Review Panel is in it's early stages, but I'm hopeful they will see better design and ground floor uses as a result of their efforts. That really should be their main focus, not this height boogeyman. Bill, turns out most of this comment wasn't about the Charlton project at all. But for the original question I posed about what diff 8 or 6 floors makes. If citizens feel that being able to 'see' a condo tower from their property lowers property values they need to explain TO or Ottawa. Heck, my property values continues to soar and I can see several high-rises from my windows and yard. The fact that folks complaining about new developments focus more on the top of the building instead of the street-level presentation of the building is pretty much the reason I ignore them. Developers could present windowless jagged concrete facade if they kept it under 4 storeys. funny enough that this item and the Shoppers big box store/ mega parking lot at King and Dundurn was dealt with at the same meeting. Apparently these two neighbourhoods want to swap. Stinson wants a slab of boxes and big parking lots, Strathcona wants multi-storey residential built to the street with retail at the ground floor and less parking. Well no one lives where they're going to see the street level presentation of the building. So for current residents that's a non issue. In both Ottawa and Toronto the few places where geography is visible are wildly more expensive than the rest. What's to explain? You're right about the difference between 8 and 6 though. It should 3. Seriously? I'm going to let the obvious trolling pass and talk about the badly photocopied, out of scale, only showing one building at a time, black and white nonsense of a visual impact assessment and analysis. From what I can make out, either some of those trees have had a massive growth spurt or this is a condo complex for ants. Even so, it still looks imposing and it looks like it's in the back yards of Alason Street residents. I live in Stinson. Have done for over two decades. I worry about the environmental impact of the development to the wildlife that is flourishing in the rail trail area. That said, I don't oppose the development purely on principle, the way a number of my neighbours do. I've been aware of the 467 Charlton committee for a few years now, and to be honest, I'm not entirely convinced of their integrity. They've got a cause, and this city needs to take them seriously. But I don't think the development is that detrimental to the neighbourhood. I've heard all of the arguments, and while I sympathize with my well-meaning neighbours, I just don't see this as that dire a situation. Stinson is suffering far worse from other issues than yet another condo development. It might not be the best location, but Stinson does suffer from a lack of developable land, which makes it a bit of a petri dish for gestating a rather insular culture. The neighbourhood has a Code Red designation, and yet some here behave as if it's Peyton Place. Anyway, possible NIMBYism aside, I just think we need more places for people to live. I'm just not sure it's more condos that are needed. When was the last time a new apartment building/complex with reasonably-affordable rental units went up in this city? I've lived in the same WWII-era building for 21 years because I can't afford to move into any place better. I'd probably consider living in such a development, if it weren't slated for condo development. They're having enough trouble filling the condos in Stinson School Lofts. Is building another condo complex really the best anyone can come up with? I am not against development at 467 Charlton, but think 3 story Townhouse would better suit the neighbourhood. I think that's the feeling of a lot of residents. I'm not against development at this site either, but this is an overly large, complex project being taken on by a neophyte developer. There's a very good chance it's just going to turn into a mess. As Ryan mentioned, it's about trust, and the writing is already on the wall for this project. 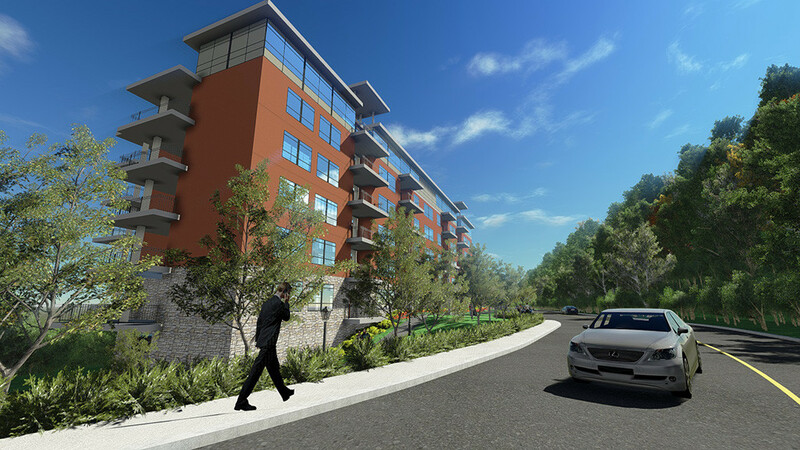 Being that we live in Canada...I wish the artist rendering would show what the escarpment condo complex will look like minus the beautiful greenery that is covering the majority of it. The condos will be alot more "towering" over the 8 months or so of the year when the trees are bare. a tad exaggerated? Our trees are bare for 4-5 months depending on where in the city you live. 8 months? When did Hamilton move to the edge of the Arctic circle? Personally I am still concerned by the stability of the ledge in question. Im told that the "standard" stability study looks okay, but as the site is anything but standard i'd prefer to see something more rigorous done there, considering the Claremont Access just a few KM away has had one lane permanently closed due to instability of the slope. It is not so much a NIMBY issue, but an issue with what strings are pulled when developers come calling at City Hall. The following points are valid to me, but I also encourage debate, correction or additional information! In the developers' initial proposal to the planning department there are exclamations about how this development is an exciting moment for Hamilton and how these condo’s will offer ‘spectacular views’ for future residents. He then states that from the Stinson neighbourhood viewpoint, most of the buildings will be hidden by the tree canopy. How can you have both? Saying that their main objective is to blend in and work with the community? In reality developers are only in this business to make a profit. That is the bottom line in any business, I get that, but how much profit is reasonable and how much is just plain speculator development. Cramming it all in for the biggest return? It is a sad world where we have to question the morals and ethics in every new build and every demolition. The NEC (and most residents) will accept development containing 4 stories or lower, but the developer wants the most units he can squeeze in. He is sticking to three buildings of either 5, 5, and 6 or 4, 5 and 7 stories because he has to provide at least one parking space per unit plus a percentage of visitor parking. He wants as many units possible on that land but he also has to match that with the number of lawful parking spots he has to provide. If you are a two car family it will most likely be a major issue. Stinson Lofts has this problem and parking is becoming a nightmare on surrounding streets. Charlton Avenue would have no on-street parking alternative. The issue most of Stinson area residents have, is that this is a small site. Big enough for the small scale businesses previously located there, but stretched to contain homes for 160+ people. The developers proposal states this development is part of the community and close to public transit. Really? Residents will have to walk (or bike) to Wentworth and Stinson or Victoria and Stinson to catch a bus. It would be Wentworth and Main to buy milk or bread if you run out unexpectedly. Not great in winter months, or for anyone not totally fit and agile. Might be a good place to set up a bike share depot though! So, one car per unit will really affect couples or families as this is an isolated spot for pedestrians. It is also just north of a busy freight rail corridor that has a street level crossing over Wentworth. Freight trains can take quite a while to pass through and have on occasion, stopped mid-stretch, causing cars to attempt u-turns either side. Residents living north of this railway have an escape route in any emergency evacuation - we just head out and north. Where will these Charlton residents go? Scrambling up the escarpment? Or down Charlton that runs alongside the tracks, towards Victoria Avenue and head-on into any dispatched emergency vehicles. Another point is, who services this location with emergency vehicles? In my estimation and looking at a map, lower Hamilton fire and ambulance service would have to travel down Wellington to Young then to Victoria onto Charlton. North of Young, Victoria is one way north and Wellington one way south stopping at Young? Using Wentworth would be okay most of the time but if it was a freight derailment, that crossing would almost certainly be blocked. Hopefully Hamilton’s Emergency Management Plan has looked at this area as part of the Planning and Development process. Getting children to school in Corktown? The developer wants to put stairs from the new property down to the RailTrail. Might be an answer but not really the best solution. The final concern is that it seems that the developers want the City of Hamilton to pay 50% of infrastructure cost. This development is a one-off profit maker, not of benefit to anyone else and they want the residents of Hamilton to pay half the costs to upgrade water and hydro services and new sidewalks on Charlton? Maybe these points can be viewed as a NIMBY attitude but really, we just want the best for our neighbourhood and also the best for new residents. CBC reports: "The developer has also asked for the city to share some costs connected to infrastructure and city services like water and sidewalks. That request was not part of Tuesday's zoning decision; any such arrangement would be something the city would decide later." This is such low-level gaming. So my reply would be aaah...no thanks. That's on you, Mr. Developer. Especially since you're planning to add back a storey, when the all-knowing City Hall planners said f* you to the Niagara Escarpment Commission. I applaud this project and hope it happens. I think it would be a good addition to this city and that area. All this NIMBYism has to stop. People that live in an area can't complain (within reason) when other people want to come and live there too: "we can live here, but you can't." I also want to agree with a point Jason made in an earlier post about the Tivoli. That thing is smack in the heart of the dt and we want to impose a height restriction? What on earth for? The dt is supposed to be a place for tall buildings that's one of the characteristics of a dt tall buildings and higher density. Its nonsense like this that keeps developers from doing business in Hamilton. NIMBYism, height restrictions delay construction projects, increase costs and ultimately push developers to Burlington.